This command will show all containers available in the system. You will see there are quite a number of containers accuumlated. 73af7edafa08        psytky03/eigandplink    "plink --file data/to"
5d37644676f5        psytky03/eigandplink    "plink --file data/to"
docker rmi IMAGE_ID to delete the image. Noticed that if a container is created fromt the image, need to either delete the container or force delete. docker pull to fetch the image from the dockerhub. 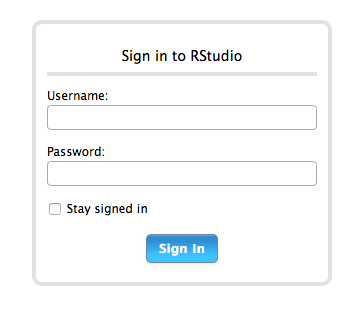 The Rstudio server image can be fetched from Dockerhub at this link rocker/rstudio. Since rocker/rstudio is not avilable in this linux system now, if we use docker run rocker/rstudio, docker will by default look for this image in dockerhub and download it this image can be found. Here we use docker run -d -p 8888:8787 rocker/rstudio to create a container and execute it. The -d indicate we run it in background mode like a web application. The -p tells docker how we are going to map port between the host and container. Rstudio Server use 8787 as its default port and here we map it to 8888 in the host. awesome, seems everything is running great. Everything is back again. If we want have the ggplot2 library installed in the image file. we need to use the commit command. It is also possible to show all the intermediate layer information of this image. Similar to snapshot of virtual machine, we can run container from any state by telling docker the image ID. 28024380329a        2 minutes ago       /usr/bin/supervisord -c /etc/supervisor/conf. e19a7c84d5f1        4 days ago          /bin/sh -c #(nop) CMD ["/usr/bin/supervisord"